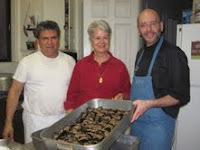 Early last December I received an email from reader Karen who had an urgent request for a Midia Dolma recipe. With that I had to confess to Karen that I’d never actually made the long version, frankly because it sounded like more effort than I was ever willing to put forth. I did have a recipe, however, to share with her. It was from my trusted Alice Antreassian cookbook, ‘Armenian Cooking Today’. After sending the recipe to Karen, she indicated that she, too, had this cookbook and had already sent the midia dolma recipe to her friends. Karen promised to let me know how the preparation went. Midia Dolma – the long version! Fr. Findikyan and Christopher Sheklian present their completed work of art! 1. Rinse mussels well. Place in basin of cold water. Sprinkle generously with salt and let stand for 1 hour to loosen sand and dirt. Drain and rinse well. Scrub mussels with stiff brush or steel pad, going over each mussel at least twice. Use a small knife to open shells part way. Cut off mussel hairs and waste matter on the inside without disturbing the pink fleshy meat. Wash each shell under cold running water once more then set aside in cold water. 2. Saute onions in olive oil until transparent, about 20 minutes. Turn off heat and add all ingredients except 2 cups water and lemon. 3. 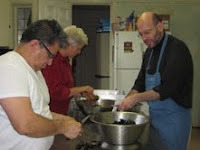 Mix thoroughly, then adjust seasonings, if necessary, before stuffing mussels. 4. 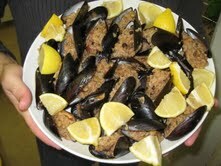 Place one tablespoon of filling in each mussel, then close carefully. Arrange stuffed mussels in alternating rows in a roasting pan. Add the water slowly over the mussels, cut the lemon in half and squeeze juice over mussels. (Reserve the other lemon half for later use.) 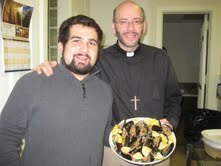 Place an inverted dish on top of mussels to prevent shells from opening while baking. 5. Bake, covered, in a preheated 350°F oven for 1 ½ hours. Allow to cool completely before removing mussels from pan. 6. Serve cold, garnished with lemon slices cut from remaining half of lemon. NOTE: This can be cooked on stovetop. Reduce water by ½ cup, bring to a boil, then simmer 1 hr. and 15 min. When I saw the photos, I couldn’t help but swoon. The sight of the midia dolma reminded me of the first time I’d ever tasted these delicate, delicious morsels. Congratulations to Father Daniel Findikyan and his cooking team for a job well-done! PS: Professor Ervine said that the midia dolma also freezes really well.